The colour suggests metal; maybe cooling? I can't find out for the photos I have. It seems a ship container but I'm not sure. Anyway, is possible to create a truck that can manage more than one type of freight, isn't it? I usually create this trucks to transport freights which don't have a lot of vehicles available. Sometimes you only have one as happens with steel, sand, cement, etc..at least in pak64. So I try to fill those gaps with these trucks. Btw, I've found the history behind Cracker Box's nick. 1960 - "F" aluminum tilt COE models later became know as "Cracker boxes" due to the boxy cab shape. I've finished those two ones: GMC 238 CrackerBox and Mack MB A-P-A. Both are light trucks with medium capacity, arround 85 km/h, 18 tn and running cost of 7.10 cr/km. Good work, vilvoh. They really look quite nice. Thanks. I'm glad you like them..they're quite balanced and the graphics are simple but effective. Btw, the next truck I'm going to create will be perhaps another road train or a steel/iron small truck. EDIT: An advance of Berliet Stratadair 20 for transporting iron ore and steel. Berliet Stradair 20 metal series finished. Two small trucks for transporting steel and iron ore (payload = 24) from 1965. The new ones I'm making: Mack MS250 Midliner and Kentworth KS50. Both probably for transporting furnitures or piece goods. The last one from now will be this Kentworth K104 NZ for transporting logs and planks.. I've to fix some details like the logs texture to avoid the grainy effect and the metallic material for the trailer, but it's almost finished. I'll use a different color scheme for each version: black for logs and blue for planks. Kentworth K105 NZ finished. With special night colors, and single or trailer versions. I've to do some scale tests to make it fit on scale, but it's almost finished. It can transport sand, stone, coal and iron ore (mainly, arids and bulk goods) and well, I think it fits on the scale (it's bigger than MHz's one, of course) Only recommended for moving large amounts of goods to short range distances....enjoy!! What a monster You could hijack some unused waytype and code it as a train, to simulate that it needs the whole road for itself. Another heavy mining truck. This time is the world biggest truck: Liebherr T282. They really look cool and futuristic! Another small one: Studebaker Proto-Truck from 1963 for transporting coal, iron ore and steel, with trailer. 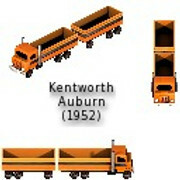 The Studebaker is almost finished so I had time to make those two: Ford c and Kentworth from Willig Transport Company. Studebaker and Willig transport Set finished. Enjoy! Another small but powerfull one: PeterBilt 344 DT, probably for transporting logs and planks. Ei Vilvoh, do you have any trucks planned that transport paper? :( It's sad to only have one choice for trucks for paper for a millennium or so. If you have done one from the earlier pages, please do tell. I'm open to suggestions but If I remember correctly, I've planned three single trucks and 3 long trucks (cab+trailer) for transporting paper. 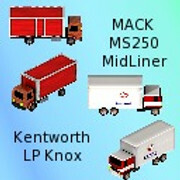 EDIT: The list of paper trucks. I'm open to suggestions, but I remember correctly I've planned three single trucks and 3 long trucks (cab+trailer) for transporting paper. Yay! That's amazing to hear. It has been pretty much irritating to pursue a BookShop line due to the default Paper vehicle having low carrying capacity and the fact that you only have it as a choice for a Veeeeeeeeery long time. Indeed you can use trains, but it doesn't really pay much so you'll just gonna exhaust your funds. The first truck for paper. It's a Kentworth KCD 825-C Auburn with trailer. Peterbilt 344 DTx series (Logs and Planks) and Kenworth KCD 825-C (paper) finished. There's a problem, for those like Moppi who want to create profitable paper lines. By the tests I've done, that good is extremly low profitable. The max income you can get with KCD 825-C is 600 cr. with a payload of 28 rolls (cab+trailer)!!.. so if the distance between paper factory and print is medium or long, I recommend not to use trucks, but large trains instead or you'll probably go bankrupt. Enjoy with the trucks! W00t! Thanks Vilvoh, these are amazing. I'm not really going for profits in regards with the paper, i just find the default truck not having a much bigger capacity daunting (add to that as i already mentioned, you only have it as a choice in terms of trucks for the entire duration of your save) specially when the Printing Works eat Paper Fast. Sometimes the distance between the Paper Factory and the Printing works isn't really that far so trucks are more space friendly for me. Ok. The truth is that I usually do not play as much as I would like to, and although I always test the vehicles in game, I actually don't realize some of those details that usual players tend to notice. Kenworth KCD 825-B ready for downloading. It's quite similar to 825-C, but with different color, a little bit more capacity, speed, cost and running cost. 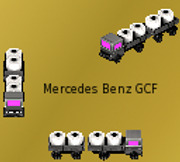 We could say it's more advanced than 825-C.
Btw, the Mercedes is almost finished. I'll post the pak file tomorrow. A single truck, Freightliner TTN: 14 rolls, 290 kw, 21 tn, 88 km/h, 1972-1984.